Bristol-based national law firm VWV took home last night the Bristol Life Award in the legal category for the second time, having won the award last year at the inaugural event. The judging panel recognised that “VWV has really made its mark on the legal sector in Bristol. With impressive client growth, it continues to push its support of Bristol communities”. Based on the Harbourside, the firm delivers first-class legal advice to commercial clients, private individuals, local charities and SMEs, and receives top rankings from independent legal directories for its education, charities, healthcare, property litigation, personal injury and contentious probate practices. 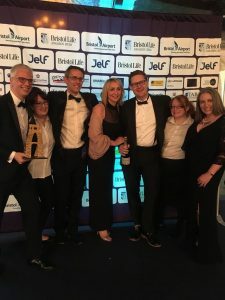 “We are delighted to have won this accolade for the second year running! And to receive this recognition for the work we do with clients in Bristol and the South West.